Wing span: 1 7/8 - 2 1/4 inches (4.8 - 5.7 cm). Identification: Wings are medium brown. 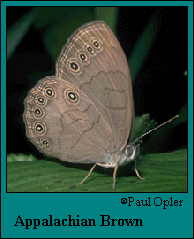 Lower side of forewing with the two end eyespots larger than the middle two; spots may not touch. Dark line inside the hindwing row spot is sinuous, not zigzagged. Life history: To court females, males patrol and occasionally perch in small sunlit openings. Females lay eggs singly on or near the host plants; caterpillars feed on leaves at night and hide at the base of the plant during the day. Third- and fourth-stage caterpillars hibernate. Flight: One brood from July-September in the north, two broods from June-October in the south. Caterpillar hosts: Sedge (Carex lacustris) and giant sedge (Rhynchospora inundata) in the sedge family (Cyperaceae). Adult food: Sap and other non-floral resources. Habitat: Wooded wet swamps, shrub swamp, forest edges, and along slow-moving streams. Range: Eastern Minnesota east to central New England and southern Quebec south through the Appalachians and coastal plain to Mississippi and Alabama. Isolated population in north peninsular Florida.